As many of you already know Sunrise Peak is one of Jeju Island’s representative attractions and is a UNESCO World Natural Heritage site. The worth of Sunrise Peak not only known to Koreans, but also the whole world. Actually a casual search on the Internet reveals pages upon pages, blog post upon blog post, and many photographs and videos about this famous attraction on the eastern tip of the island. 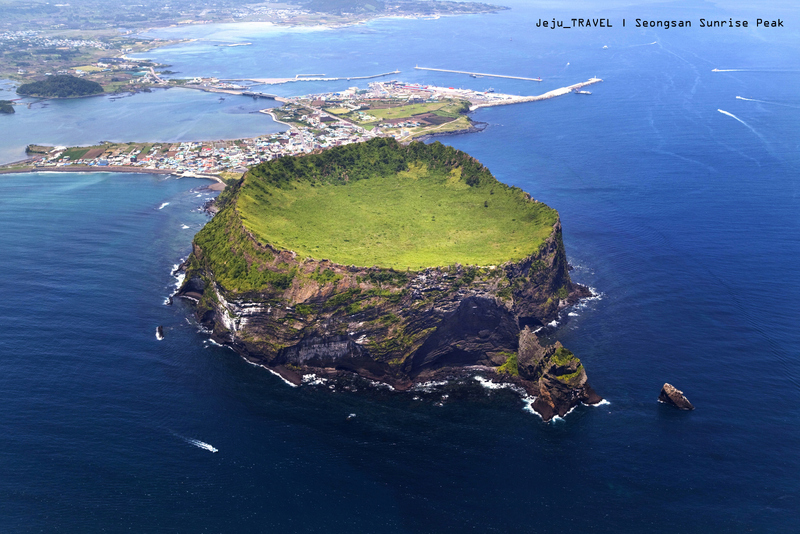 Therefore we’re just going to introduce the practical experience of Jeju Tourism’s visit. On the day we went the weather was fine and tourists buzzed around. Prior to hiking up try to take a look at the map so you can know where all of the other attractions are round the base. There is an explanation hall, temple, and Japanese occupation era caves to explore off to the side, which many people miss. Of course you need a ticket to go to the summit, but don’t worry. The price is very agreeable. It is only 2,000 WON for adults. Jeju residents get in for free. Be sure to bring your ID card because if you don’t have it you will be charged the full price. After getting your ticket hand it in at the gate and enter the main route. The sun was very strong on the day we climbed so many people had a sun umbrella. Bring your own drinks too because the shops on the way to the top sell refreshments at a higher price. The hike should take a nominally fit person around 15 to 20 minutes. While doing this be sure to take a break and admire many of the unique rocks. They stand pointed and vertical. Even mysterious. Turn around too. The view of the Seongsan area appears. It helps a visitor understand why Sunrise Peak has so many awards and designations. In the distance the cars sit. The exclamation comes out naturally. Now after the final rest stop with benches the summit stairs become more narrow. Not far to go. For many it is good to have the feeling of accomplishment at the top and have this leisure time. Take a moment to look around carefully. Slowly. Jeju Island is an ideal place to do this. At the summit Jeju Tourism saw a small boy with sunglasses looking through binoculars. The view is beautiful enough, but after he was finished we took a look too. We also got our ‘proof photo’ at 180m above sea level. Now days it is a kind of habit to do this then post to Facebook or Twitter. Many Jeju residents still climb Sunrise Peak. They are amazed by the view. Visitors may also get lucky at the top with a guide who can explain the origins of this rock that erupted from underwater a few thousand years ago. Now there is a different hiking trail leading down. Even this way is beautiful. During this part of the journey Jeju Tourism spent more time than planned thanks to the view. As we mentioned at the top of the post visitors can also see a haenyeo(woman diver) show, take a boat, visit a temple, and see old Japanese occupation-era caves. Finally looking back on the scene from the bottom gives you a feeling of awe. 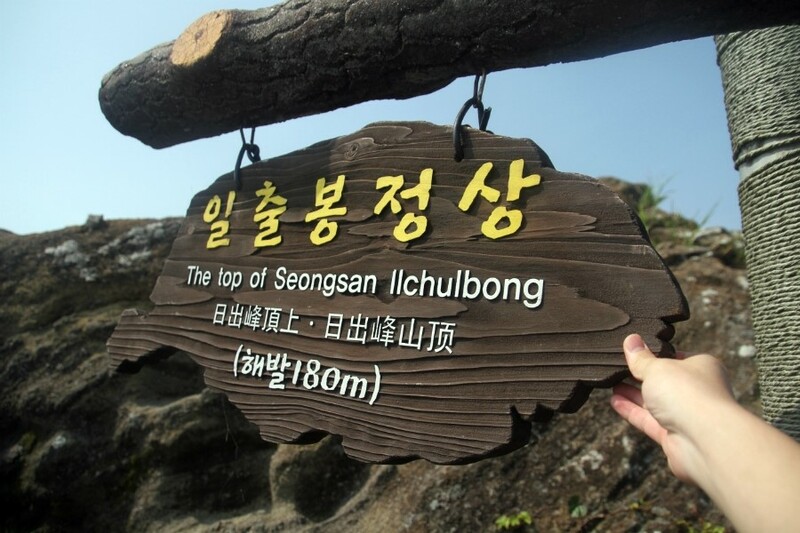 Seongsan Sunrise Peak is a ‘must see’ recommendation from Jeju Tourism and in the future we’ll be sharing our direct experiences with more postings like this. Send us a message with any questions you may have.